"At first sight of this gigantic ship, so heavily armed and armoured, I felt sure that she would be able to rise to any challenge, and that it would be a long time before she met her match. A long life was very obviously in store for her....as I began my service in the Bismarck, I had supreme confidence in this ship. How could it be otherwise?" (Fourth Gunnery Officer, Baron Burkard von Mullenheim-Rechberg; one of the Bismarck's few survivors). "She was fast and sleek, with an elegant silhouette and a jaunty flared bow. More than one sixth of a mile long (820 feet 4 inches), 118 feet wide at the widest point along the waterline, and with a displacement of 44,734 tons (48,626 when fully loaded), she well exceeded the 35,000 ton limit laid down in the Anglo-German Naval Treaty under whose terms she was supposedly built. Her eight fifteen-inch guns in four twin turrets were the biggest ever mounted on a German warship, and made her more than a match for the firepower of any single battleship or battle cruiser in the entire British fleet....44% of the ships total weight consisted of various thicknesses of armour. Not surprisingly, among the most heavily armoured areas were the four big gun turrets, a, b, c, d, working from forward to aft, and known as turrets Anton, Bruno, Caesar and Dora. Here the armour ranged in thickness from five to fourteen inches..... In short, the design of the Bismarck aimed to realise the dream of Germany's Admiral Tirpitz who had described the ideal battleship as 'an unsinkable gun platform'". (Bismarck, Robert Ballard, Hodder and Stoughton). The sea trials were extremely successful. "Even at full power the huge ship surged forward smoothly, with only the slightest bow wave. Lindemann was particularly delighted when Walter Lehmann, his Chief Engineer, reported that top speed proved to be 30.8 knots, slightly better than the design speed of 30 knots. This would make the Bismarck very difficult to catch if ever she broke out into the Atlantic". Bismarck, Robert Ballard, Hodder and Stoughton). I'm actually doing this a day late really! Hitler went on board the Bismarck on the 5th May 1941. Following operation Berlin, "Lutjens said he thought that a similar deployment involving Bismarck could be even more successful, especially working with Scharnhorst and Gneisenau, and supported by the new heavy cruiser Prinz Eugen. Certainly, he told Hitler, no single British battleship could hope to take on Bismarck and win. This did nothing to settle the German Chancellor's mind.... He reminded Lutjens of the lethal potential of British aircraft carriers and their torpedo bombers"
"During his visit, Hitler heard no specific reference to the battleship's forthcoming sortie into the Atlantic. The German Naval high command had decided to keep the Fuhrer in the dark about it until after Bismarck and Prinz Eugen sailed. They feared not being allowed to proceed". (Killing the Bismarck, Iain Ballantyne, Pen and Sword). "Under the cover of a black, starless night the Bismarck weighed anchor and headed west. It was 2am on the morning of 19th May 1941. The months of rehearsal were finally over. Operation Rheinubung - Exercise Rhine - had begun....Captain Lindemann announced over the ship's loudspeakers that the purpose of their expedition was to reach the Atlantic and sink as much British shipping as possible over a period of several months. Lindemann's men had no knowledge of the elaborate planning that had led to this moment. They only knew that action was at hand" (Bismarck, Robert Ballard). "While the British were enjoying the benefits of accurate intelligence, the Luftwaffe and the German naval-intelligence system were delivering duff gen in large quantities to Lutjens and his task force. A full day after Hood and her consorts had sailed, Group North - the Command Team responsible for 'Rheinubung' in Northern waters - blythely informed Lutjens that they were reconfirming that his breakout had not been detected. No ship movements from Scapa Flow had been sighted, they told him, and no operational detachment of British forces towards him had occurred either. It was a kind of Grand Slam of misinformation.... Rheinubung was doomed. The fact was that one of the operation's key advantages - which had so sustained 'Exercise Berlin' - had been lost. Surprise was gone, and the pursuit was on". (Hood and Bismarck, Mearns and White). Lutjens rejected the idea without giving any reasons, according to Externbrink. He refused to listen to any advice or explain his thinking. "Suddenly a great black shape loomed out of the mist no more than seven miles away. 'Ship bearing green one-four-0' shouted Able Seaman Newell aboard the Suffolk. Then a second ship appeared, and he shouted the alarm once again." Suffolk heeled heavily to starboard and sought sanctuary in the fog bank, allowing Bismarck and Prinz Eugen to pass her, albeit that Bismarck's guns could reach her at any time. Meanwhile, Norfolk's captain "misjudged his relative position and emerged six miles in front of the Bismarck, with the great gray leviathan closing fast. Before Norfolk could escape back into the mist, five salvoes straddled her. One shell bounced on the water, and ricocheted off the Captain's bridge. But only shell splinters came on board and no-one was hurt. The jolts from the firing of Bismarck's big guns had put her forward radar out of action. this meant she was now blind to what lay ahead". (Bismarck, Robert Ballard). The canvas for this painting is 3' x 4' and I am using Michael Harding Artists' Oils and Old Holland Classic Oils. My chosen medium for thinning the oils is Liquin. The canvas is primed. 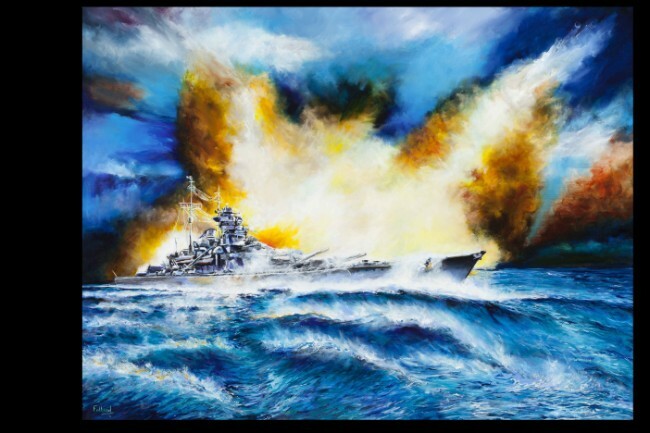 The hull of the ship, to be the pivotal point of the painting, is mapped in, and underpainting of the smoke produced by the blast of the guns is then superimposed. The sea is sketched in using the colour, 'Phthalocyanine blue lake '. Always a fun time covering large areas of the canvas. I use a favourite colour of mine, Scheveningen light blue, the darker blue being the appropriately-named Prussian blue. Shades of orange and yellow ochre make up the background, these colours also being used to begin the formation of the gun smoke. I shall be concentrating on achieving just the right effect in this area, as I hope the finished work will succeed in conveying the awsome fire power of the Bismarck. I begin to map in the sea; the aim here being to demonstrate the ship's power through the water, complementing the firepower of the vessel. Colours in evidence are Phthalocyanine Blue Lake, King's Blue Light and Deep. The sea formation will be a vital component of the final work, as it will need to convey the speed and direction of the ship, as well as demonstrating its own relentless power. Today witnesses glazing in the sky and work commences with a variety of yellows, whites and browns for the smoke. In due course, glaze upon glaze will be laid upon the smoke, which is key to demonstrating the awesome fire power of the ship. Artistic licence is used in the far right of the picture, the smoke there representing the demise of the Mighty Hood. The sea is slowly being developed, moving from the bow region back to the stern. The main features of the sky are established and, similarly, the extent of the gunsmoke. The main structure of the ship is blocked in. It is important to note the characteristics of oil paint; it is very slow drying, although this process can be accelerated with the use of a paint medium. When dry, you can either paint over work you have already done, thereby obscuring any unwanted areas, or apply the paint very thinly, which is called 'glazing'. This technique can produce spectacular effects as the paint underneath will shine through the glaze you have applied. This is one of the reasons I most love oil paint. There is a need for great patience and it can be very frustrating. Today's release represents, in reality, several days' work, as each day sometimes achieves only minor overall alterations which need to be built upon. The Old Masters would work on several paintings simultaneously, allowing drying time for the paint on each canvas before proceeding. In effect, this is what I have been doing between the Hood and Bismarck paintings. As with the Hood painting, a milestone that the whole canvas is now covered as the final part of the sea is blocked in. Now the detail must be addressed. There are many glazes to be added for the smoke and the sea, and the details of the ship will be addressed - lots still to do! This picture represents two or three days' work in effect, as there has been a lot of 'drying time' in between the application of many layers of glazing on the underpainting of the sea. The 'white horses' not only illustrate the tempestuous sea, but also serve to reflect the light and colour of the fire and smoke. The effect I am trying to create is strongly influenced by a very graphic and moving quotation from Sam Wood in 'Killing the Bismarck' - one that I shall reserve for later in the course of the story! Key areas of this painting are the sky and the sea. The glazing process to achieve just the effect I am seeking is a long and intricate one. Consequently, quite a lot of work can produce a series of apparently minor alterations, but which will build to produce the final picture. This is in contrast to the painting of the Hood, where there are far more components in the overall picture, so that the changes are more obvious to see on a daily basis. The alterations in detail to this picture are so intricate that often even I find it hard to spot the changes! However, the smallest brush strokes build up to make a significant difference to the final result. The latest two photographs demonstrate a building up of detail from the conning tower towards the stern. Because of the wide angle view of the ship, getting the proportions right is extremely tricky, and there will be inevitable alterations in due course. More refinements on the hull, and more glazing and modifications to the sea. Today, I have been adding detailing towards the stern of the ship. Today's picture represents a substantial amount of change of detail and addition of finishing touches. I realised that what had been niggling me for several days was that the funnel was too tall, so that has been reduced slightly. The two turrets, Anton and Bruno, have had their guns slightly angled to port. I am grateful to Paul, who has contributed generously to our online forum, and who also commented on the angle of the guns. It is something I had researched myself, and, after Paul's comments, felt I should slightly modify this part of the painting. I have portrayed the effect of the wind blowing the gunsmoke over these turrets. This was something I had always envisaged but, inevitably, it has to come at the end as it is an overpainting of the underlying image. I also feel it provides a link between the three main elements of the painting - the ship, the sky and the sea. So we're nearly there! Tomorrow will see the final product - the professional photograph of the completed canvas! Hooray - as for the Hood, today the final painting is revealed. Please see my notes on the HMS Hood birth of a painting page to see what happens now about producing the prints etc. "The ruffled surface of the sea seemed to constantly change from brilliant white diamond sparkles to dazzling ice-blue, to flashing green and then to deep, awesome red. It seemed as though our ships were forging ahead through a garden of sparkling jewels....you who are about to die today, don't be afraid, for this is what heaven is like" (Sam Wood, medic, Prince of Wales). I have tried to capture the essence of this wonderful description in my portrayal of the sea - I hope I have achieved that in some measure at least.